Just what is "hardboiled crime and mystery fiction?" I've spent a lifetime trying to come up with a definition, and haven't had much luck. I know what it isn't: It's not Agatha Christie; it's not British tales of ingenious murders using unorthodox methods, solved by quirky, plodding amateur sleuths. It's not courtroom dramas or spy novels or studies of slashers and psychopaths. What it is can be more easily explained by perusing the Hardboiled Crime & Mystery Checklist that is part of this site. Read Raymond Chandler's essay, "The Simple Art of Murder." Or read Raymond Chandler, period. Or Dashiell Hammett. Or Elmore Leonard. Or even Robert Parker. 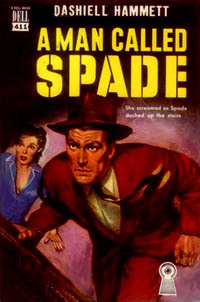 On this site, in addition to the Hardboiled Checklist, you'll find a collection of paperback covers, links to the best hardboiled sites on the Web, a few original articles on the subject, and whatever else I come up with when I'm sober. Have a good time, but watch your back. These are some pretty mean streets out here. Dashiell Hammett virtually created the hardboiled genre with his stories from BLACK MASK magazine. This Hard-Boiled Noir Web Ring site owned by Brad Lang.